Boreality is a project of Prairie Fire Press, the Manitoba Chamber Orchestra (MCO) and various other partners that explores and celebrates the boreal forest of Manitoba (and Canada) through an arts-driven, collaborative method. Over the past three years, a team of five artists made a series of trips to boreal forest communities, using a multidisciplinary approach involving writing, sound, music and photography that resulted in “Cantus Borealis: Song of the Forest” by Sid Robinovitch, which was premiered by the MCO in April 2011. You can read about the activities of the Boreality team on Boreality Phase One website. 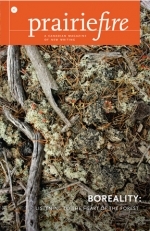 In spring 2012, Prairie Fire magazine published a supplement devoted to Boreality, featuring contributions by all the members of the creative team along with a selection of work on the boreal theme by writers from across Canada. We will continue to explore the vastness of the boreal forest in the months and years to come. Please check this page for news of exciting developments.